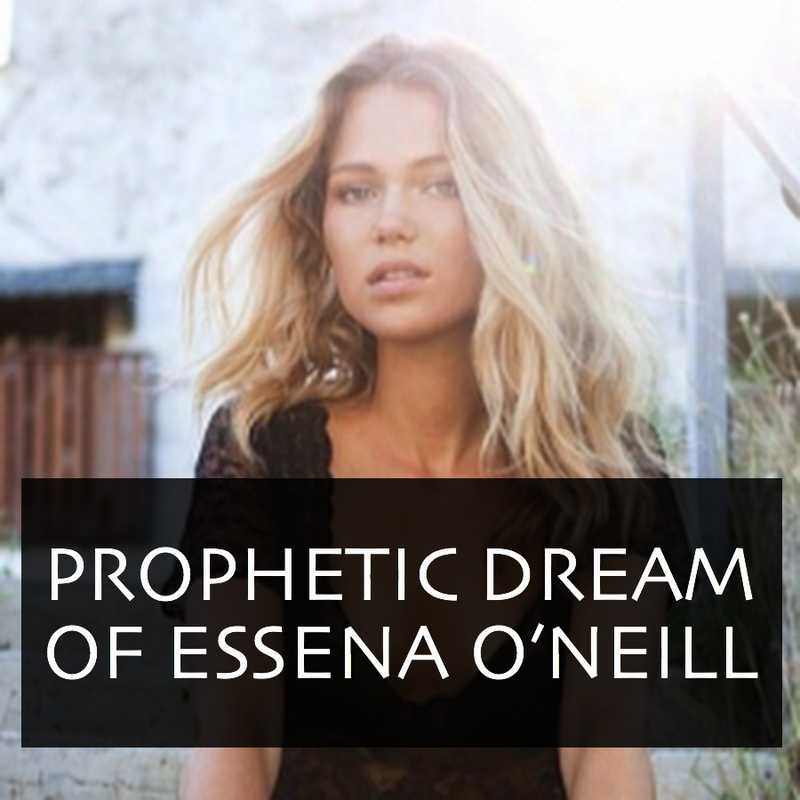 On Sep 9, 2015, I had a powerful prophetic dream of a very popular mainstream, youtube celebrity named Essena O’neill. At that time I had no idea why I received a dream about her. I’ve watched a couple of her videos for her vegan & healthy eating message. Although I chose not to explore much more of her content as her persona seemed like any typical worldly young girl and based on appearances & popularity. She seemed drawn into the hype of LA etc which led me to cease listening to her. I was surprised that the Lord gave me such a powerful dream encounter with her. For most part he gives me prophetic dreams of individuals actively involved in ministry, men & woman that He is using to spread the gospel. On top of that, at that time, the dream of Essena seemed completely abstract. Nonetheless, the dream was so real and potent that I immediately sent Essena a private message on the day of Sep 9, to share the details with her. I did not receive a response. It is likely she has not even read it. As of this last week, lo and behold, the dream comes to fruition. In the last days of Oct 2015, OUT OF THE BLUE, Essena O’neill announced to the world that she was done with social media. She was quitting it for its superficial nature and message. She was giving it all up. On top of that she is intent to reveal the artifice behind it. She has created a new site called www.letsbegamechangers.com largely to help draw deluded youths especially young girls out of the lure and deception of social media. Breaking past the need to present themselves a certain way to gain social adoration. This is her story on why she quit the lies. I was Absolutely amazed and stunned by this development. Immediately the dream came to mind! It all began to make sense, and it was not abstract anymore!!! And I now understand why I was given a prophetic dream about her. The Lord was revealing that He was behind the changes in Essena’s life. He had engineered it all. And He confirmed this by releasing a prophetic dream to me that revealing the stream of events that would take place in her life before it manifested. He is using Essena to draw youth out of worldly ways and deception. He drew and wooed her out of superficiality and ordained this change for His purposes. I have since found out that Essena has a desire to lead a wholesome life. To get married. She emphasizes family. All of which are traits of the Kingdom of God. Pray for this young girl, because the Lord has His Hand on her life in a big way. Pray that she is truly sanctified and set free of the ways of the world and is saved by the truth and liberation that can only be found in Jesus. I’ve watched a couple of your videos as I enjoy the vegan lifestyle too. I’ve only watched a few of your videos so this is unusual that this happened. I had a dream of you last night. You were pregnant and you were keeping it secret. The father of the child was good looking and young but he wasn’t really concerned about what you were going through. You ran away from California and began to travel to several places whilst keeping the pregnancy secret. You ended up living with a reliable older man who was helping you by giving you financial help as well as a room. I’m not sure exactly what your connection with this man was. There were 2 friends. Very young and extremely immature friends who were helping you keep your secret secret…by placing a lot of drama on themselves instead. Their names were Jill and Angela. Then a group of people gathered. We were all at the beach and it was time to come together in a circle and Confess. Each one had to reveal a secrets publicly to the circle. They would then be freed and released from them. That was the extent of the email I sent her. I kept it brief mainly because as I stated earlier, I could not understand why I was given such a dream. But I wanted to send it to her to ensure that she received details of it. *When I checked my dream journal, there were more notes that I had made. I saw the boyfriend whom she broke of with. He had a narrow face with chiselled features and dark hair. He was lost in his own world, disconnected and lacking warmth. 2) The two immature girls who were helping her keep her secret, a secret, one of these girls became pregnant in turn. Her name was Jil. 3) The reliable older man, I had described in my notes as “a man of God”. 4) There was also another person who arrived on the scene on the beach. This person was very talented and known themselves, however they were upset and jealous of the support and stipend she was receiving from the man of God. They threw an angry tantrum on the beach … Seeing this fit, I was very concerned for Essena because she was pregnant and needed to be protected at this stage. 5) The Circle of Confession that Essena was leading was very important for the girls in attendance as it was freeing them from their fears. In fact, I even joined the circle! I was about to confess my own fears. With the current change in the direction of her life, I now am able to interpret what the dream means. 1) I believe the BABY she is having is the new project she is launching to Expose the Superficial Nature & Allure of Social Media. 2) I believe the good-looking boyfriend that she left in LA, is someone real but it also represents her leaving her superficial bf aka social media who only loved her for her looks. This represents her choosing true love, beyond physical appearances. 3) In addition, her running away from California in the dream, represents her running away from the superficiality & artifice that Los Angeles represents. Sure enough, in her latest message she has expressed her disdain for the superficiality of LA. She has indeed left LA and it appears that she does not want to pursue modelling anymore. 4) I believe that the reliable older man helping her in the dream and supplying her needs is our Heavenly Father. 5) In the dream, she was glowing, excited and happy like a pregnant mother. In her latest vids, as she launches her new project, she appears to have the same glow & excitement. 6) The Circle of Confession in the dream seems to be akin to the Forum she has set up on her new page. This is the verse that Holy Spirit showed me for Essena. Essena if you’re reading this, feast on this Living Word that He has just for you. Wow. God is doing amazing things. Anyway, that’s His nature – to amaze us ). I saw this Essena’s announcement somewhere in the web Just Before ( exactly one click before ) I clicked a link to your page, Ahava. What does it say to me, since it is a pure God guidance ? Going to my secret room to get words from the Holy Spirit right Now ! ) God bless your ministry, Ahava Sarah Fischer !